You Are Here: Home » Skin Care Treatment » What You Need to Know About Stork Mark or Stork Bite? What You Need to Know About Stork Mark or Stork Bite? You analyze every inch of your baby’s beautiful face and notice a little pink or red blotch right where their nose meets their forehead or on the nape of their neck (Oh no!). This common birthmark is lovingly called a stork bite, and thankfully, it usually fades with time. Stork bite birthmarks are salmon coloured patches that occur due to stretching or dilation of blood vessels underneath the skin. Here is more on meaning, causes, and treatment of stork marks, salmon patches or angel kisses. 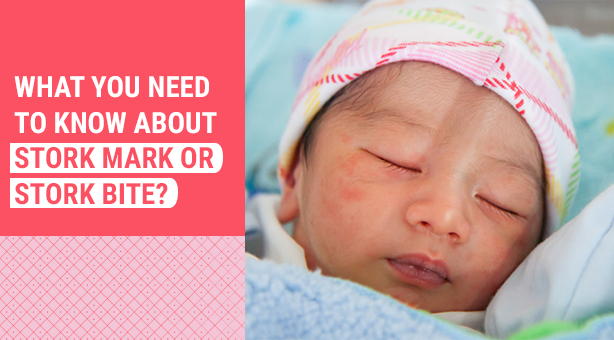 Also Read: What Causes Birthmarks in Babies? What Is a Stork Bite or Stork Mark Birthmark? Stork Bite Birthmark or stork mark birthmark is a pink, flat shaped birthmark that appears on nose, eyelids, forehead, scalp, nose, upper lip temporarily. It is more permanent at the nape of the neck. It results from nesting of dilated blood capillaries resulting in a red or pink patch that is harmless. Where Is A Stork Bite Found? What are the Causes of Stork Bites? Many tales have been used to explain to young children the conception process. However, there are scientific reasons for the occurrence of stork bites. In fetus growth, some fragments including capillaries and hemoglobin can remain in the blood. Due to their fragmentation, they may not be fully developed. They cause the constriction of the fetus blood vessels. Once the baby is born, the mark is visible but fades after a few weeks. Medicines such as vasodilators and hypertension used by pregnant women are absorbed by the fetus and may cause enlarged small blood vessels. Upon birth, the already formed capillaries may still be dilated causing stork bites. A family history of stork bites is usually passed down to the baby. This is because they lack the enzymes responsible for protection from remnants which flow back to the fetal circulation. More so they lack enough melanin which greatly assists in hiding the spots and marks. High temperatures caused by hot weather, crying, anger or excitement may trigger the vasodilation of blood vessels. This is because there is an increase in blood flow to the area and the skin becomes very sensitive and itchy especially around the eyelid. This will cause the occurrence of stork bites. A mother’s diet may include high levels of calcium channel blockers, and when absorbed by the fetus it can prevent the entry of calcium into the blood vessels causing their dilation. The lack of proper diet may also cause underdevelopment of the fetus. This may result in the birth of an underweight baby who has immature blood vessels and can cause stork marks. Stork bites can fade but it can take time. If you want to speed up the elimination process, you can get substantial results through laser removal treatment at Skin City. Skin City is one of the few places in the world offering treatment for birthmarks like Hairy Melanocytic Nevus, moles, Nevus of Ota, Becker’s nevus, Haemangioma, AV malformations, Verrucous Epidermal nevus and Nevus comedonecus. All these treatments are non-evasive and can be done in an outpatient setting from any of our clinics. The healing time is also minimal. The key to successful treatment is removing the birthmarks as soon as possible. In infants, the marks are often lighter and less expensive therefore requiring fewer treatments. Typically 6-10 session treatment at an interval of several months is required to reduce the birthmark. It is also preferable to treat patients at an early stage because the child is spared the physiological trauma and complication of growing up with a birthmark. Laser Treatment for Birth Marks Removal is comfortable and cost-effective—and fast. Contact Skin City Clinic today on 098902 25577 and schedule a consultation or treatment for birthmarks. Our specialist will give you all the necessary information about the birthmark removal procedure during your consultation.